Though Día de los Muertos is now over, I often think about the ofrendas, or altars, that my mom sets up yearly. She drapes my deceased grandmother’s handmade lace tablecloth over a flimsy foldable table. It stands inconveniently by the narrow corridor connecting the living room and kitchen. 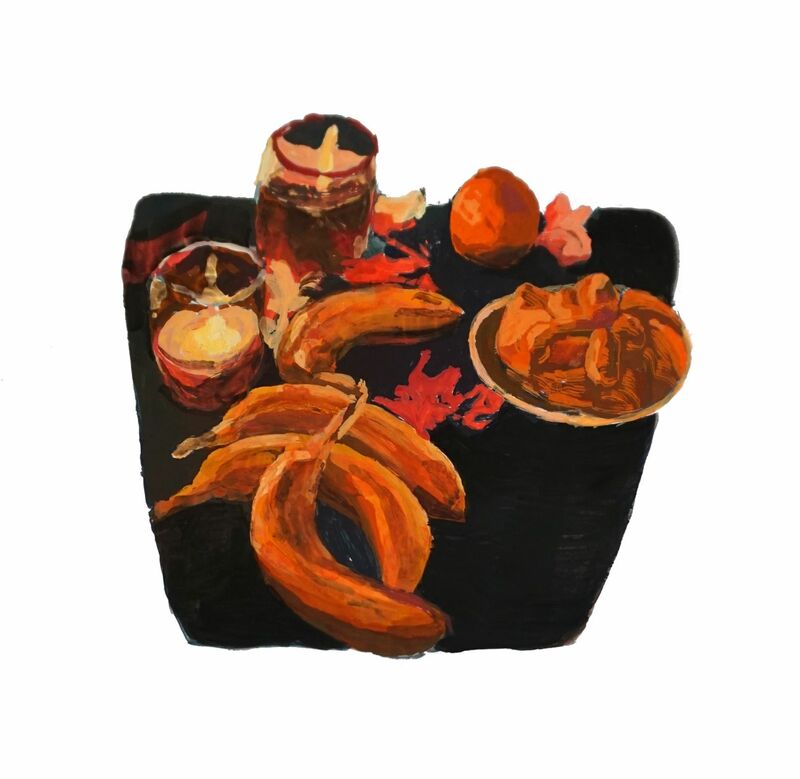 On it sits a large meal consisting of smoky mole, pan de muerto (a sweet bread made for Dia de los Muertos), fruits, and candies. The table is illuminated by a warm candle plastered with illustrations of saints, one for every dead family member. When I was a kid, I would bump into this wobbly table and fear that I had accidentally lit the house on fire. Then she would close her eyes and inhale with her nose to mimic what she meant. I felt the need and curiosity to have an explanation for everything. My childhood was always marked with moments that made me question what is real and what was not. In Mexico, my parents did not attend school past the 6th grade, and as I grew older and entered high school, it was harder for me to explain my science and math homework to them. The topics seemed outside the scope of my parent’s understanding outside of the reality I lived at home, but that is exactly what excited me. These logical topics that I learned in school seemed exotic, seducing me with their ability to explain natural phenomena didactically through physical evidence in ways that my mother’s vague explanations did not. When I entered seventh grade, I stopped believing in anything but science, since there was seemingly no evidence for the supernatural, my mother’s faith, nor the significance of practices like Día de Los Muertos. In discarding non-empirical knowledge, I created a worldview based on “facts”—to rationalize death, the fate of humanity, and my own futurity. Through extensive Wikipedia binging and watching science documentaries, I immersed myself in newfound information about the vastness of the universe and the insignificance of my life in the grand scheme of things. Maybe there was nothing after death, and my mother was just leaving food and candles for the open air. From there, I read more science fiction novels that allowed me to further speculate a future with mystical qualities that resembled mother’s spiritual practices while retaining my need for scientific explanation. Recently, I began exploring the crossover between speculative fiction and magical realism in my writing. As an adolescent, I found it exciting to speculate what next year’s scientific advancements could lead to, but now, studying science has made me wary of trusting scientists and secular perspectives. Nowadays, I speculate on what my ancestors would have thought about the world if they knew general relativity like I did, or what modern day Mexican culture would look like today if Mexico was never colonized. Magical realist perspectives are not unlike those of speculative fiction. The literary genre that began in Latin America in the mid 20th century arose from writers mixing European modernism with afro-indigenous narratives and imagery that were overlooked in the western world as outside of academic discourse. It essentially interlaces realistic narrative with unrealistic “magical” components that are treated as non-magical, creating a story that is fantastical, childlike, and surreal while formulating real pointed arguments on society. Drawing from these genres allows me to find compromise between the dystopian present and the perspectives around decolonization that I am now developing, in hopes of making sense of my experience. When I first learned about orbits and Kepler’s laws, I couldn’t help but think about how my ancestors practiced cyclical rituals, sacrificing people for the sun to rise each day. By calling upon the intangible and the speculative to answer scientific questions, I can draw lines between disparate marginalized and privileged knowledges, can converse in questions that I think about constantly. These literary genres blur the lines between traditional and empirical knowledge. Perhaps these narrative methods can aid us in envisioning a future by discussing the present day in all of its history, intention, and layers. Aldous Huxley’s Brave New World imagined a dystopian world that used eugenics as a means of producing political subjects but probably never fathomed that it would manifest in technologies like CRISPR, a method of editing the DNA in embryos that is in continual development today. In a world in which people pay to know their ancestry through 23andme, unknowingly giving a corporation license to sell their genetic information, we can begin reformulating our notions of what is possible and impossible, whether scientifically or otherwise. Perhaps the we can speculate decolonial futures that seem impossible in today’s dystopia. When I feel ill or sad, my mother does a limpia on me. This involves rubbing an egg over my body while saying an Our Father. The cold touch of the eggshell makes my skin prickle. The egg gets cracked into a glass of water, and she takes a moment to inspect the yoke carefully, then points to something invisible, maybe it’s the little tendrils of egg white still attached to the yoke. “There is the ojo you had. Oh my. No, you had three ojos on you,” referring to the evil eye that envious people may have placed on me. When I remove the possibility to believe in spaces like these, outside of rational conventions, I am left with an aching stomach. These practices give me internal form and hold me close late at night. Death and living are unquantifiable phenomena of the human experience, rationally unpredictable but experientially very real. Early pioneers of magical realism made sense of the worlds that they occupied through inclusive uses of knowledge. Likewise, the speculative fiction novel of today is the magical realist novel incarnated. It is a colonized individual’s lived experience where climate change, the internet, late capitalism, and political figures like Trump make the future unforeseeable through its own dystopian absurdity. Chang-Rae Lee, author of On Such a Full Sea, a speculative dystopian fiction novel, stated in an interview that his novel was meant to be a social realist novel about China, however it changed to become a speculative fiction novel instead. Speculative fiction has always had its roots at the present day sociopolitics. When authors speculate about the world, they are often making a commentary on the flaws our present day society has and their consequences. As part of the universe, our intention is what sews together reality and the tangible things we observe. I found that pulling loose the strings that held together the universe for me left me looking to other strings carrying intentions which were not my own. Human beings are not programmed to simply learn for the sake of knowledge. We are constantly making sense of that knowledge and using it to cultivate our own sense of identity and belonging, just as people did in the past. I thought that learning more about the universe could help me disentangle what it means to be alive, but instead I was left feeling aimless, hollow, and uncertain about reality itself. Science is not as straightforward in explaining everything as I had anticipated. It cannot comfort me when its information leaves me with no sense of purpose but to simply exist––this defies the very nature of human beings. Diving deep into rational empirical knowledge revealed to me how similar secular perspectives were to magical ones, because no matter how coldly we try to synthesize the universe, we as human beings are doing the synthesizing. We tie our own meaning to death and existence and living and consciousness. Thinking through irrationality instead of rationality unpacks even harder questions about the universe and the human condition and how they are intertwined. My ancestors may have laid food out for the dead or sacrificed humans in order to keep the sun and moon cycles going, but these actions are built on the same irrational desire Elon Musk holds for getting on the quickest ship to Mars. Both seek to find closure in death and the continuation of life. I think: what if my mother and father did not have an ofrenda where they can feed their parents again? I had treated science as a religion and scientists as untouchable truth bearers, but it is important to acknowledge what objectivity does not tell us: about our subjective human experience and human actions and death and life and the value of human and nonhuman beings. When someone feels entitled to tell me to “get over” discrimination or genocide, they choose to ignore the human consequences of history in favor for their “objectivity,” creating misinformation and erasing emotional information within history. Science does not account for the significance behind the darkness that lies inside my skin, the stories underneath my feet, or the how the maiz based foods I eat are actually sacredly related to me. To view the world in cold objectivity is to intentionally erase histories. I don’t think of my parents’ epistemologies as fundamentally less true than what I study in physics. Often I feel placed at the intersection of these two worldviews—of those defined by western science and those defined by traditional knowledge systems. It is daunting to make sense of them individually, let alone simultaneously. When I write stories, it feels natural to use both sides, because they express something authentic and real, instead of trying to suppress any one. Attempting realism without the constant mess of a mind I have, trying to balance the ancestors and knowledges inside me, is painful. The ways I’ve seen authors and artists use modernist tools of Europe—often objective, rational, positivist lenses—as a means to express indigenous and nonwhite worldviews is inspiring to me because they are shifting the dynamic of what art can be. Maybe my mother’s view on ancestors is nonsensical, childlike and unrealistic to the western academic eye, but combining it with our world that privileges scientific knowledge allows me to speculate my own decolonial perspective for the future. The absurdity of the modern day is driven by the magic of science and technology, and painting with the “magical” may render a more vivid picture of ourselves and reality than simply outlining a literalist image of the future. When I study the stars, I don’t just inhabit a scientists body, but also an indigenous ancestor’s body who is scanning the skies. One that knows the mechanics of astrophysics as well as the hidden relationships my past selves had with the sky. As humanity nears the edge of environmental catastrophe, of nuclear war, of disenfranchisement and marginalization, perhaps even our ancestors can help guide us in making sense of the present/future. There are parallels to be made between this world and the apocalyptic nature of colonization my ancestors faced, while still deriving a sense of self, and the world I inhabit. I find this especially inviting to envision what the future could hold for me and my ancestors, and in finding ways to heal from whatever dystopian reality we are in now. In building my own ofrenda for a cousin I once knew, for my passed grandparents who I don’t remember, and all of my ancestors long dead who I’ve never known, I think about how important the intention behind carrying this tradition is to me. Laying food for dead people seems absurd because they may not exist anymore. Their rotten bodies are in the earth now. But their knowledges are in my mind and their presence is in my body. This is to say, yes, my worldview might not always be physically real; but it is true, and the world today is riddled with absurdity. Writing speculatively alongside “magic” is easy because it is my everyday reality. It is the mundane, the realistic, and the boundaries between what’s real and what’s not; difficult to synthesize in a singular drawing, so let me paint a picture with these pigments instead. JORGE PALACIOS B/R’20 is stargazing.